There’s living, and then there’s elevated living. This property is the latter of the two. Located at 6448 E El Sendero Road, this is a home high in both opulence and sophistication. Nestled on Black Mountain and overlooking the town of Carefree, this is an opportunity for ideal Arizona living. New owners will be able to enjoy the serenity of the expansive desert landscape from a vantage that is truly second-to-none. As with any home aspiring to offer an elevated experience, 6448 E El Sendero Road is an intimate escape from the toils of day-to-day life thanks to a gated entrance designed to ensure complete, round-the-clock privacy. 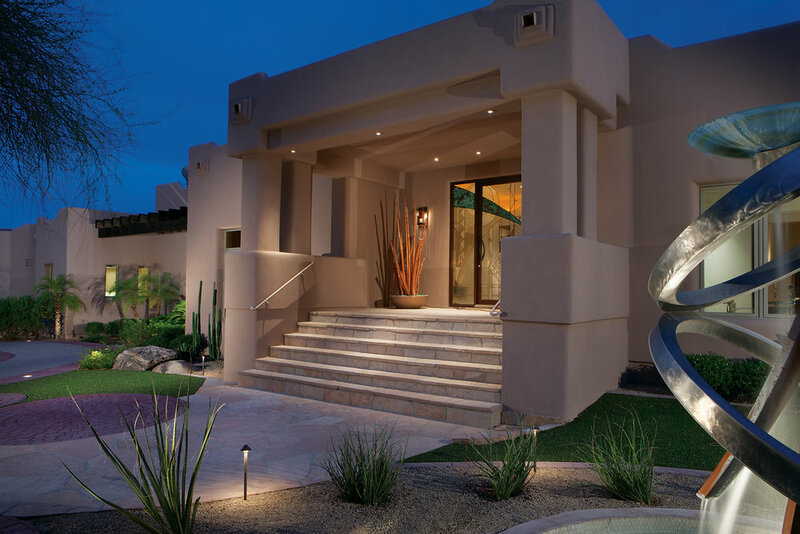 Inside the gates, follow the meticulously laid flagstone pathway past clean desert landscaping and brushed steel fountain to reach the main entryway and its striking artisan glass front door. Passing through the door, it quickly becomes apparent this is no ordinary estate, but something closer to a luxurious resort. The interior living spaces are accentuated by inviting open architecture, the type of design that welcomes natural light during the day, and friends and family at night. At every turn, one theme is ever-present—the views are a treasure to be highlighted, not hidden. 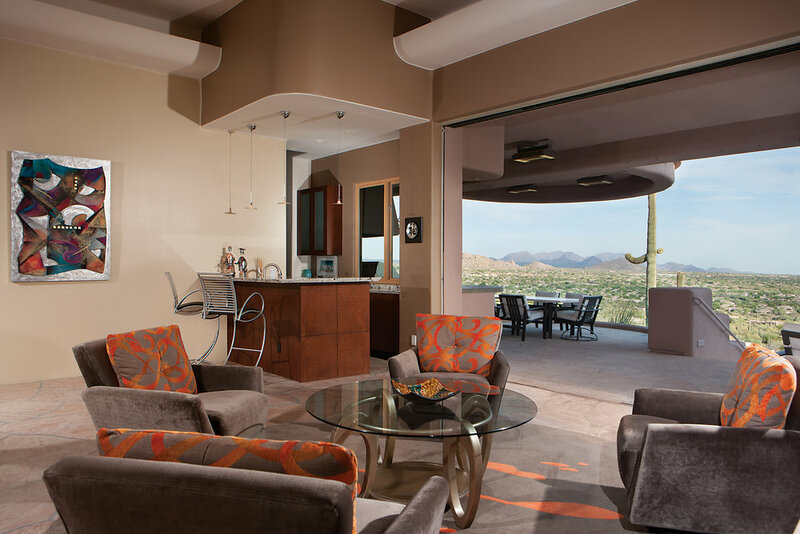 The use of glass across the home is both generous and exquisitely done, making it impossible to miss the dazzling amber of an Arizona sunset and the soft twilight colors on the Boulders. 6448 E El Sendero Road is—quite simply—modern, Arizona lux at its finest. Every space inside this 6,063 square foot, 4-bedroom, 4 ½ bathroom home captures the essence of modern luxury living. Glass, stone, wood, and copper make their presence amply known throughout the interior, including the kitchen, where clean lines, Sapele matching wood grain cabinetry, double islands, and high-end stainless steel appliances encourage culinary creativity. But the coup de grâce—the retractable glass walls that allow for seamless passage between inside and out. 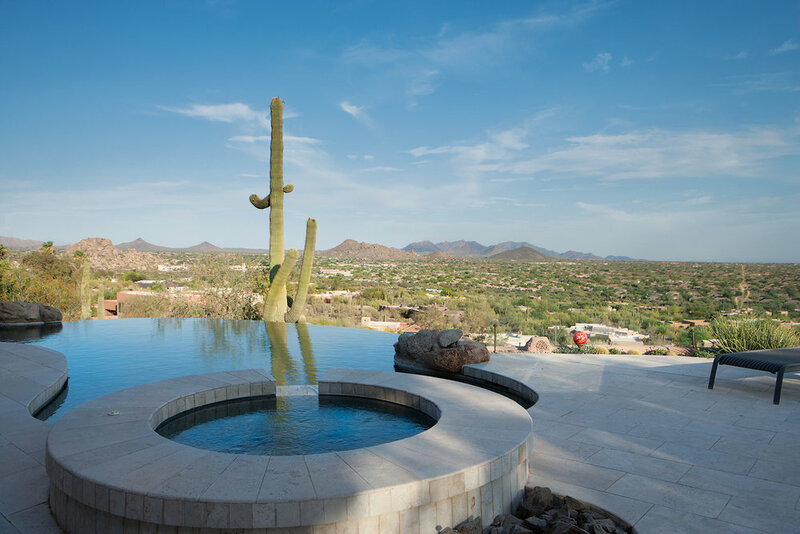 Once outside, feel free to soak in the sun with a refreshing beverage on any one of the three terraces built into the property, or take a refreshing dip in the expansive infinity pool overlooking the desert below. And when winter does roll around, don’t retreat inside—spend that time relaxing in the heated poolside spa,enjoying a light meal beside the open-air fireplace, or gazing up at the stunning night sky. Yes, the main home and outdoor terraces of 6448 E El Sendero are nothing short of spectacular, but the six-car garage is a gem all-to-often overlooked. Iron-clad glass-paneled garage doors create a living, breathing showroom for your prized mobile possessions. Collectors and connoisseurs beware; there is no better private garage in the area, which makes 6448 E El Sendero an oasis fit for any true automotive aficionado.